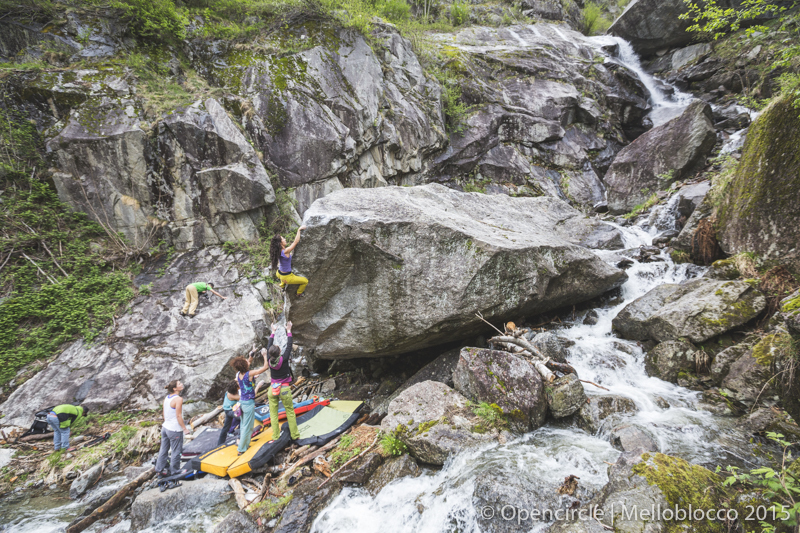 The 12th edition of Melloblocco took place again in the beautiful Val Masino and Val di Mello. Also this year the event was followed by thousands of motivated Boulder-fanatics. As every year the organisation cleaned up some new boulders, and put a prize money on them for the Mellobloccers who wanted to challege their selfes. But this is not the reason why so many boulderers took part at this event. It is more about the spirit. Meeting friends, sharing the same passion and being in a beautiful place. The Melloblocco started on Thursday the 30th of April. Surprisly the weather was great and while a lot of climbers were on their ways to this event, others started to explore the brand new boulderproblems, established by Simone Pedeferri and his team. This year the boulders were spreaded over three different places– Val Masino, Val di Mello and Bagni di Masino. So everybody had to study the map to find the new boulders. For some climbers it took some time to find the boulders because Simones self-drawn map is not easy to handle. It seemed like searching mushrooms in a big forest. But this is also part of the game. The second day of Melloblocco was the waiting day. The morning started with heavy rain and it kept on raining all day long. So most of the climbers were hanging out at the “Centro Polyfunzionale” drinking Coffee. The psyche was high for the sunny Saturday and the number of climbers grow up to more than 2500 participants. Most of them climbed longer then the official climbing time and arrived late for the night program, put up by the Mello-organisation. For example people could follow the slide shows from some wellknown climbers like Steve House or watching films from Adam Ondra or Jacopo Larcher. And we, the Blackdiamond team showed a presentation about the „clean climbing idea“ and last but not least the event ended up with the legendary classic Saturday night party. Sunday was the last day of the event. The climbers got some more time to climb on the humid boulders after the rainy night. At 3pm the circle closed with the classic awards ceremony. All in all, it was again a great event with a lot of passionated climbers who couldn’t get stopped by the wet conditions. I really like to take part of this event and hang out with a lot of other passionated climbers for some days. But in general i prefer it more quiet and climb in a small group, so i was also happy to leave this rainy over-crowed place and extend our trip to visit the Verdon, for my first time.